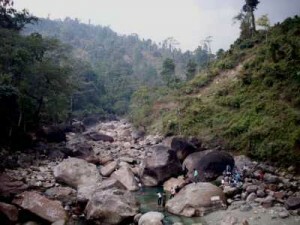 Jalpaiguri district comprises of major parts of the Western Duars, which were once a very thinly populated forest area. The region gradually matured into an administrative unit with the development of inhabited villages, tea gardens and small factories. Air: The nearest airports are Baghdogra 153 km Koch Bihar and Hashimara airstrip 6 km from Jaldapara. Rail: The most convenient railheads are Shiliguri and New Jalpaiguri, which are important railway junctions in the northeastern region. Road: National Highway 31, running through Jalpaiguri, connects the district with other parts of the State. Barrage Project Site: A fascinating drive along the Tista Canal through Gajaldoba’s forest leads to the Barrage Project site – an ideal picnic spot. Buxa Duar Fort: Popularly known as “the Gateway to the Kingdom of Bhutan”, the fort once served as a prison for India’s great freedom fighters. The fort can be approached on a trek through the Jainti Hills. Buxa tiger Reserve: Comprising of natural reedlands and sal forests, the serves as a vital linking corridor for elephants migrating between the forests of Bhutan to the north and the Manas Tiger Reserve in Assam to the east. Apart from tiger and elephant, a wide range of animals including gaur, sambar, leopard and sloth bear can be found here. The Rydak River is rich in Mahseer. Best season to visit is November April. Duar: Bordering Bhutan, east of Kallimpang, is vast stretches of Virgin forests and lavishly green countryside unknown to tourists. Here, the turbulent Tista River and its tributaries flow through the foothills of the Himalayas. Home of several endangered species; the Duars terrain is filled with nature, adventure, wildlife and plenty of tourist attractions. Gorumara Wildlife Sanctuary: A small but compact wildlife sanctuary, Gorumara Sanctuary is home to the one-horned rhinoceros, bison, wild elephant, deer and many species of birds. Jaldapara Wildlife Sanctuary: A lush panorama of mighty trees, perennial streams, sandy riverbanks and extensive belts of tall grass, Jaldapara is the permanent abode of the one horned Indian rhino. Flanked by the rivers Malangi and Torsa, the forest here is rich mixed deciduous and riding elephants is the only way to move about. Besides the rhino, Jaldapara is also famous for the Royal Bengal Tiger, Indian bison, elephant and reptiles. A variety of birds, including the Bengal florican can also be found here. Best season to visit is November to April. Jalgaon: Situated by the side of Jaldhaka River on the Indo-Bhutan border, Jalgaon is a beautiful picnic spot. The West Bengal State Electricity Board’s Jaldhaka Hydel Project is also situated here. Madarihat: The gateway to Jaldapara, Madarihat is the site of a tourist villa made entirely out of timber. Nalrajar Garh: The ruins of this long-forgotten fort are hidden in the forests of Chilapata Range. Excavations prove that it belonged to the Gupta age. This entry was posted in Jalpaiguri, West Bengal. Bookmark the permalink.